PREVIEW: Star Wars The Clone Wars 5.17 "The Jedi Who Knew Too Much"
We step into the second episode of this 4-part "Ahsoka" arc with "The Jedi Who Knew Too Much". To recap from last episode, Ahsoka and Anakin have found the culprit behind the bombing of the Jedi Temple hangar and murder of several clones and Temple personel-a civilian named "Letta" and taken her into custody. 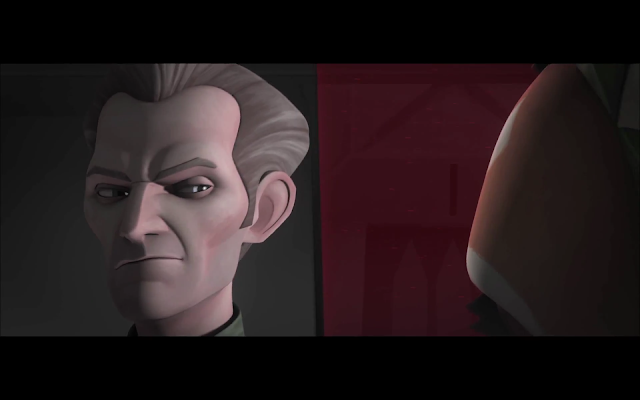 In this clip, the newly promoted Admiral Tarkin and Ahsoka Tano argue on how to deal with Letta. First of all, it's great to see Tarkin in action again. He had a brief cameo a few episodes ago, but we have not really seen him since Season Three's "Citadal Arc". I specifically watched all three of those episodes before stepping into this arc, and the relationship (or lack thereof) between Ahsoka and Tarkin is certainly great to watch, especially when you know that the disagreements on how their views of the Republic will greatly intensify over these next few episodes. In this clip, we see Ahsoka visiting Letta in prison. It is interesting to see how different the Republic Prison system has changed since previous episodes. Before, it was a massive room with smaller cells, yet this is showing much more of an Imperial design. To say I am excited for more of this arc is an understatement. The previous episode was a great first step into what is the beginnings of the Empire, and possibly the end of Ahsoka? I may not have liked Ahsoka at first, but if they end up killing her at the end of this, I'll be crying like a baby. I'll admit it. "The Jedi Who Knew Too Much" will air on February 15th. Be sure to catch Star Wars: The Clone Wars Saturdays at 9:30 am on Cartoon Network.